Fusion U-Tip Making Pliers and the Fusion Bond Maker have simplified making your own outstanding u-tip and square shape fusion bonds for strand by strand hair extensions. Check out the photo of the professional looking hair extension bonds you can make with these tools! The strong composite plates delivers such a high PSI (pounds per square inch) when making bonds, they come out perfectly formed, amazingly thin and there has been no hair shedding with the tips we make. Typically, when working with keratin-based fusion bonds, finger protectors are needed to minimize the discomfort of working with hot glue. You won’t need any finger protectors with these tools. They’re simply not necessary as you’ll never need to touch hot glue when making your bonds. 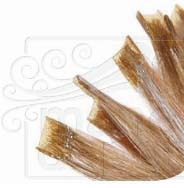 Here’s what we do – take a bulk hair strand and dip it into your fusion pot with the melted keratin chips or pellets. Coat both sides of the strand about 1/4″ down from the top. Wait a few seconds and then insert into the Fusion U-Tip Plier or Fusion Bond Maker tool. Press and wait about 5-10 seconds. Remove and presto! You’ve made your own strand fusion bond. 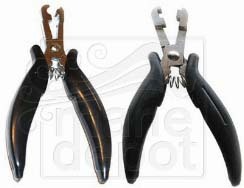 We also carry the Professional Fusion Removal Plier so you have the complete set!